He was the one who lied and cheated. But I realize now that I can’t get off scot-free. At first, it was easy for me to point every single finger and toe at my husband for obliterating our 10-year marriage. He’s the one who cheated and walked out without looking back. And long before that, he repeatedly shut me out, choosing to bury himself in his work to avoid what was happening to us at home. Blame was my coping mechanism to get through the first difficult months of our separation, and “how dare he (gasp! )” was my mantra. I rallied an entire army of supporters who, like me, were totally, utterly and completely aghast at the nerve—the gall—of this man. 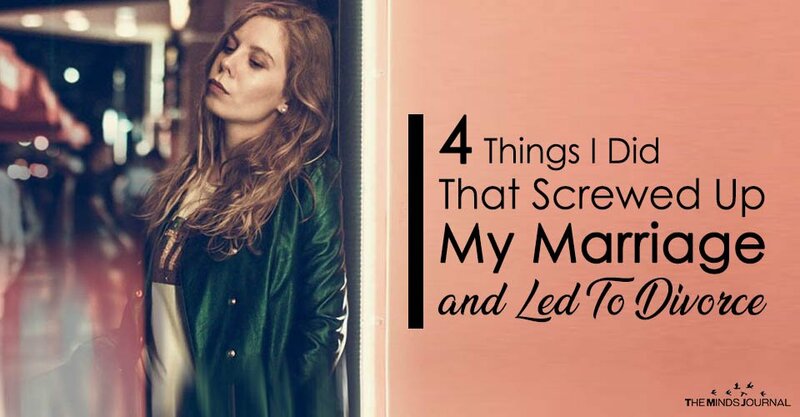 Here’s what I now know actually screwed up my marriage and led to divorce. May it will serve as a warning to you. Before it’s too late. They were at our house frequently, sometimes arriving unannounced and walking right in. They’d “help out” around the house doing things we never asked them to, like our folding laundry (incorrectly, of course). We’d vacation with them. They’d correct our children in front of us. My own fears of upsetting my parents kept me from drawing a line in the sand and asking them not to cross it. The few times I did stand up for my family’s autonomy, I didn’t hold my parents to the same standards in future. My husband, quite literally, married my entire family.